Does our society needs post traumatic growth? Experts from overseas will arrive in Northern Ireland this weekend with one question at the top of their agenda: how can we deal with the legacy of the Troubles? This is not a reference to the G8 summit – though the meeting of world leaders in Fermanagh does offer a dramatic backdrop for reviewing the current state of the peace process. The more detailed discussions on our past are to take place at a special conference being held as part of the `Derry-Londonderry City of Culture’ year. The two-day event entitled Poisonous Legacies 2013 runs from Friday (June 14) and will include speakers from trouble-spots around the globe who will detail their experience of conflict, and help identify the pitfalls, opportunities and hard choices that may face communities here. “One of the things we want to do at the conference is look at what has happened elsewhere in the world,” said Paul O’Connor, spokesman for one of the organisers, The Pat Finucane Centre (PFC). “We have got someone coming to talk about the conflict in Chechnya, and people who were involved in the exhumation of Spanish Civil war graves. “Both of those are examples of how not to deal with history, because nothing was done. And while we have Putin coming here for the G8, the legacy of the war in Chechnya simply hasn’t been dealt with." In June the Foreign Secretary William Hague announced that Kenyans tortured by British colonial forces during the Mau Mau uprising of the 1950s will receive £20million in compensation following a successful legal campaign. It and other international case studies including the Argentinian experience will also feature in the conference. What do such events tell us about our own history? The clear lesson seems to be that the past is unlikely to go away. The Eames-Bradley report published in 2009 and named after the figureheads who shaped it, was an ambitious bid to deal with the past in a holistic way. It addressed the needs of victims, their various demands for either truth or justice around murders, and sought to arrive at an agreed account of what happened during the decades of conflict and why. But the political and media storm over a proposal for a one-off payment to all victims, regardless of how their loved ones died and which included paramilitaries, saw the plan crash. Since then the British and Irish governments have shown little desire to restart the debate. The PFC spokesman Paul O’Connor says: “Whether we like it or not, I think there is a legal inevitability about certain issues that the British government is not going to be able to avoid. “At this moment in time the Director of Public Prosecutions is having to ponder the issue of the possible prosecution of soldiers for Bloody Sunday. “And if they said they are not going to prosecute on these cases, then how can they prosecute on other cases? The bitter debate over legislation restricting the access of ex-prisoners to Special Advisers posts at Stormont also highlighted how the past can still overshadow the present. The PFC spokesman adds: “I don’t know what’s going to happen. I don’t think the political parties have engaged. I don’t think they have dealt with [the past]. “Equally, clearly the British government has been happy to claim that it can simply wash its hands of it, but it can’t. The Pat Finucane Centre and other groups have helped victims of violence from various backgrounds to discover what happened to their families. The South East Fermanagh Foundation (SEFF) was formed in 1999 to address the needs of many of the victims of violence in that area. It is a small border community that SEFF spokesman Kenny Donaldson says witnessed 42 deaths, of which he says 39 were victims of the IRA. “There were murders that were carried out where the people would have walked from one side of the border to the other (to escape arrest in Northern Ireland),” he says. Much of his organisation’s focus has been on putting pressure on the Irish government to address the role of previous Dublin administrations in the conflict and in particular how border security and the extradition of republican suspects was handled. He says, however, that the families he represents would be wary of a South African style truth and reconciliation commission which he feels would not suit Northern Ireland’s needs and might focus on security force actions. He says there are doubts over whether it would expose paramilitary activity. “There just isn’t any trust that that would be the case,” he says. He agrees action must be taken to heal the wounds of the past, which he says might otherwise impact on future generations. But he too has noted reluctance among sections of the public and politicians to focus on the task. “I don’t think there is any appetite to do that,” he says. “We do have a job of work to do convincing people, because if we don’t this is going to cause problems down the line. The Victims Commissioner Kathryn Stone said the recent disputes over the introduction of the Special Advisers bill and the plan to build an international peace centre at the site of the former Maze prison, illustrate how the past continues to influence the present and the future. “One of the important things this highlights is the need to have a more strategic overview of things like dealing with the past,” she says. Individual victims have different needs, with the commissioner noting that some want to pursue convictions for killers, while others want instead to identify the truth of what happened to their murdered relatives. Sinn Féin is asking if the controversial pursuit for the truth of what happened in the past should be separated from the search for reconciliation, to allow the healing process to develop, as was reported here. Republicans are also appealing for unionists to engage in a wider debate on how to address the past. But political distrust and suspicions between communities remain high, and unionist parties have reacted with scepticism. Stormont leaders have announced plans for an all-party group to seek agreement on controversial issues including divisions over flags and parades. 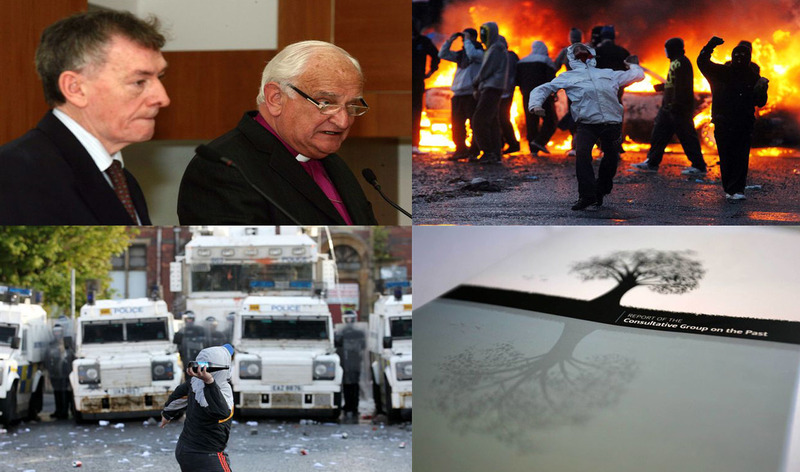 Among the topics is how to handle the legacy of the Troubles. The talks will be led by an independent chair and will represent the first effort to find a solution since the Eames-Bradley blueprint was effectively binned. A recent debate dealing with the past on the Radio Ulster programme Sunday Sequence included an expert who noted that we are accustomed to hearing of the impact of `post-traumatic stress’. But they added that we rarely mention how some people suffering loss and upheaval can come through that pain to eventually experience `post-traumatic growth’. We might hear more about the search for such growth in the next phase of the peace process. When the G8 has ended, and the summer marching season has passed, there should be a sharper focus on whether the planned talks at Stormont can help.